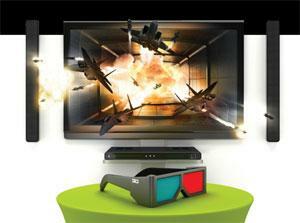 We compare pros and cons of projector, DLP, and flat-panel 3D setups. 3D comes in many shapes and flavors. 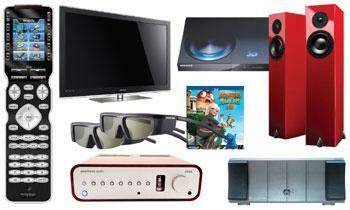 You can buy a flat-panel TV with the capability, or go for the larger screen sizes of a DLP TV. The other option is a video projector. All have their merits as you’ll read about in the following profiles. After reading them, you should have a better idea of which 3D formula will work best in your home. 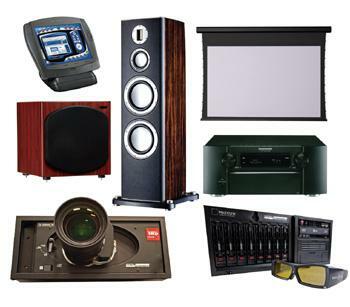 Of course, no TV is worth a grain of salt without speakers and source equipment, so we’ve included a list of components used in each profiled 3D setup. This, combined with each homeowner’s impressions about 3D viewing, will help you put together your own 3D entertainment system. 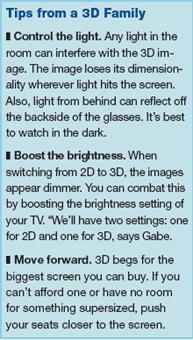 For three years Gabe Montemurro and his wife, Elizabeth, had been using a Sony SXRD rear-projection TV – quite happily. But the thought of being able to view content in 3D was too compelling for these early adopters to ignore. Plus, since the Montemurros’ baby was now walking, they thought it would be best to buy a slimmer flat-panel display that could be pushed inside their entertainment cabinet and beyond the toddler’s reach. Gabe had a few other prerequisites for a new display besides being flat: it had to be on the higher end of the performance scale, it had to be plasma and it had to be somewhat affordable. Samsung‘s high-def PN58C7000 TV fit the bill, coming in at under $3,000. As a bonus, the 58-incher came packaged with a 3D Blu-ray player, two pairs of 3D glasses and a 3D Blu-ray disc of Monsters vs. Aliens. After a few viewings of the movie, the Montemurros were hooked. “3D is much more immersive than 2D,” says Gabe. “You find yourself leaning forward, sitting on the edge of your seat.” Unfortunately, there are only so many times you can watch the same movie. “Monsters vs. Aliens is the only true 3D source we own, and when we purchased the system in March there simply wasn’t much content available,” Gabe laments. Even with the lack of 3D programming, the family still gets to experience bits and pieces of 3D just by pressing the 3D button on the TV remote control. The PN58C7000 features proprietary 2D-to-3D conversion technology, which when activated renders 2D images to near 3D quality. “If it wasn’t for the conversion technology, 3D for us would be extremely disappointing,” says Gabe. They were most impressed, however, with how their collection of digital pictures looked when displayed in 3D. “Suddenly, there was so much depth and dimensionality, so much so that I went through my favorites and created a special 3D playlist,” Gabe says. As a longtime fan of Mitsubishi products, Mark Capriola is benefiting from the manufacturer’s commitment to the new viewing technology. The audio and video enthusiast recently traded in his 65-inch WD-65833 Diamond DLP TV for a 73-inch WD-73837 Diamond DLP unit. In the process, he got a full 3D upgrade, “something he loved the idea of,” says custom electronics professional Dirk Dutton of Primetime Audio Video in Rockford, Ill. The fact that the new screen was much larger than the biggest 3D flat panel available, yet cost significantly less, was one more plus. Primetime sold the set to Mark for $2,400 (plus $399 for a starter kit, which includes two sets of glasses and an HDMI adapter); a 63-inch 3D Samsung flat panel, which Primetime also sells, would have cost closer to $3,000, says Dutton. Aside from making room for the larger set, there was little Primetime had to do to Capriola’s living room to make it suitable for the new display and its 3D presentation capabilities. Even the audio was good to go, thanks to their existing 5.1 surround-sound setup of an Integra receiver and Definitive Technology speakers. “All we really had to do was program it into the home’s existing Control4 home automation system,” says Dutton. This tie-in allows the DLP to display menus for operating the home’s audio/video equipment, lights and other systems. Primetime also created a special 3D button that switches the DLP from 2D mode to 3D. Capriola navigates to the command by using his iPad or a handheld remote. That same command kick-starts a Sony Blu-ray player, another recent addition to the entertainment system. Previously, Capriola was using a PS3 to play Blu-ray movies – a good choice, “but the Sony player is able to load movies a lot faster, and we didn’t really want to wait for the PS3 3D update,” says Dutton. The combination of the 3D button and the Sony Blu-ray player makes the transition between 2D and 3D seamless, and eventually so will the sources in Capriola’s well-stocked equipment rack in the basement. 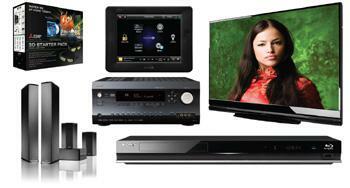 Wired to the TV through a Control4 video distribution processor are a Vudu BX100 set-top box, Dish Network VIP922 satellite receiver and Sony BDP-CX7000ES Blu-ray player, among other components. Some of these content providers have already started to offer 3D programming – with much more to come – so Capriola’s assortment of 3D choices is bound to keep growing. The owner of this high-end theater had only a standard video projector installed when 3D started to get hot. Unsure of whether he should trade in his recently purchased projector for a 3D model, he agreed to let the company that designed his theater demonstrate a unit in his home first. “We told him we’d give him a deal on the installation of the new projector if he’d host an open house for builders and clients in the area,” says Shawn Hansson of Logic Integration in Denver. The Logic Integration installers temporarily staged the Digital Projection International (DPI) 3D Titan projector on a table, leaving the existing DPI 1080p Titan projector mounted to the ceiling. Also left for the demo was the 130-inch Stewart Filmscreen – a perfect size for 3D viewing, according to the homeowner. As part of its $130,000 3D package, DPI includes a Dimension server from Mechdyne with the Titan projector. The server comes preloaded with a variety of 3D material, and it left a lasting impression on the homeowner.